Not to be confused with Pipe Works. Pump Works is a location inside Bowser's body in Mario & Luigi: Bowser's Inside Story. 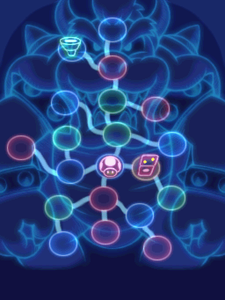 This area appears to be in Bowser's esophagus. 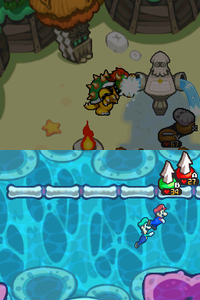 It is is accessible to Mario and Luigi when Bowser drinks water from the Sea Pipe Statue in Plack Beach. Drinking water as Bowser floods the area, which allows Mario and Luigi to swim and certain objects to float. Once he stops drinking, the water will drain from the area. Mario and Luigi travel here to search for Princess Peach, but instead they find Toadsworth. This area also features ten Attack Pieces, that once gathered, allow Mario and Luigi to use the Fire Flower Special Attack. Also, it has an obstacle (a cannon that launches food for a giant Chombone) that is required to obtain the Stingler, an item that can be used to open the exit door resembling DNAs and access other areas of Bowser's body. The area can be roughly divided into three parts. The first part starts from the entrance and consists of three chunks in a row. Mario and Luigi must clear the obstacles of this part to reach the orange pipe in the last chunk, which leads to the second part. 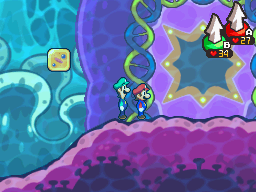 The second part starts with a DNA-like door, which the bros. must first bypass and clear the rest of this part to find the Stingler, meeting Toadsworth and learning the Mini-Mario technique on the way. Once the bros. use Stingler on the DNA-like door, they can exit the area and unlock other areas of Bowser's body including Flame Pipe (their next area to check), Nerve Cluster, Airway, Chest Station, Nose Deck and Pipe Yard. Later in the game, after Mario and Luigi learn the Drill Bros. move in the Energy Hold, they can tunnel underground in the first chunk of the first area (the entrance) and go right to access the third part, where they can find ? Blocks containing items like Super Mushrooms, Star Candy, Guardian Socks and 1-Up Deluxes. Mushroom x3 In a ? Block in the second scene. In a ? Block in the third scene (the rightmost in the upper area of the map). In a ? Block in the lower scene before the rightmost one in the DNA door area. 1-Up Mushroom In a ? Block in the second scene. Syrup Jar In a ? Block in the upper scene before the rightmost in the DNA door area. Nut In a ? Block in the rightmost scene in the DNA door area. Retry Clock In a ? Block in the second scene. Stingler In the fourth scene in the DNA door area. Attack Piece #1 Enter the middle pipe in the second scene and hit the ? Block below. 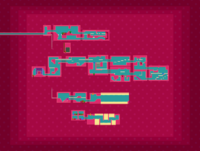 #2 In the attack piece block in the third scene (the rightmost in the upper area of the map). #3–5 In the attack piece blocks one scene past the DNA door. #6 In an attack piece block in the upper scene with stair-like platforms beyond the DNA door. #7 In a ? Block in the upper scene before the rightmost in the DNA door area. #8 In an attack piece block in the lower scene before the rightmost one in the DNA door area. #9 One scene left and there's another one in an attack piece block. #10 One more scene left and there's another one in an attack piece block. Picnic Wear In the ? Block in the lower-right of the rightmost scene in the DNA door area. Fighter Wear In a ? Block two scene to the right of the DNA door. Super Mushroom x2 In a ? Block in the first scene down the entrance. Star Candy In a ? Block at the end beyond the warp pipe maze down the entrance. Guardian Socks In a ? Block at the end of the straight route down the entrance. 1-Up Deluxe x3 In a ? Block at the end of the warp pipe maze down the entrance. This page was last edited on December 12, 2018, at 21:31.